If you want to learn the basics of real estate math in the easiest and the most convenient manner possible, then you should consider enrolling in the real estate math certification program offered by Brainmeasures. 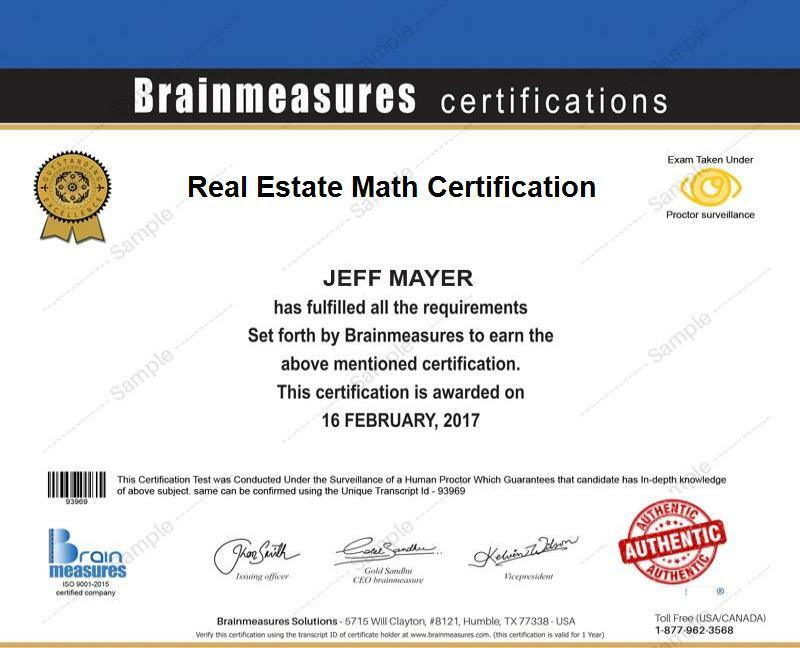 Brainmeasures makes it a point to simplify its online certification programs including the real estate math course to make sure that all its participants will never have a hard time understanding even the most confusing concepts and formulas. With the kind of real estate math training that you will receive from Brainmeasures, you will no longer find it hard to compete with the other experts in the field. This certification course makes it easier for you to understand all types of real estate transactions as well and this is a huge help in your attempt to successfully accomplish all your tasks and responsibilities as an expert in the real estate industry. You have to complete the real estate math certification course offered by the company before you finally take a hold of your certificate. The real estate math certification program which is now available at Brainmeasures is extremely beneficial for all aspiring professionals who wish to enter the real estate industry. It is more ideal for real estate beginners and professionals who wish to understand the basic instructions in applying mathematics to real estate scenarios and become aware of the basics of all the vital elements of the real estate industry including appraisal calculations, profit and loss calculations, debt service, finance and interest calculations, area computations, loan underwriting and real estate property taxes. Completing your real estate math certification is a huge help not only in boosting the number of career opportunities that you can easily access but also in increasing the amount of salary that you will receive. If you decide to work as a real estate appraiser, then you can expect this to let you earn around $47,000 to $92,000 per year. Earning your real estate math certification and working as a real estate agent after it is also a very profitable career. It allows you to earn around $104,000 per year with the possibility of huge increase through commission.